Stores may be starting to discount their summer hiking gear by the time fall starts in the Rocky Mountains. For many hikers, however, the season is really just beginning. More and more, hikers are extending their time on the trails before winter arrives and freezes them over until springtime. The change in season offers more comfortable, cooler hiking temperatures and less crowded trails with the added bonus of colorful trees. Here are the top five Rocky Mountain trails to embark on this season. Don’t wait to explore them. If the brisk morning air I’ve woken up to the past several weeks is any indication, winter is definitely around the corner. Laramie Peak rises out of the Laramie Range of Wyoming’s section of Medicine Bow National Forest. The 10,272-foot peak is the highest mountain in the Wyoming section of the range — just behind Colorado’s South Bald Peak. Don’t let that intimidate you, however. The mountain does not rise above treeline, making it a relatively easy day hike. 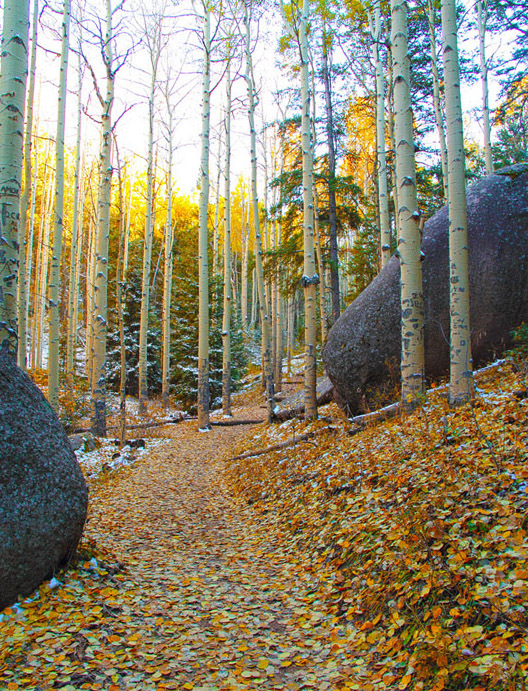 The trail is lined with mostly pine trees but also some aspens that, in the fall, are dripping with colored leaves. The well-maintained trail to the summit starts in Friend Park at around 7,500 feet and stays at a moderate incline most of the way to the top. Consider making it a weekend trip and camp over the night before at the Friend Park Campground, which lies across the road from the trailhead. Get up early and catch some of the sunrise from the trail for even more reds and yellows. Warnings: It costs $10 to camp and a $2 donation is requested at trailhead for non-campers. To reach the trailhead, turn west at Glendo, Wyoming and drive the mostly gravel Eastbrook Road through the town of Eastbrook. Follow signs to Friend Park. Fall will greet you every step of the journey to the top of the Devil’s Head Fire Lookout — which is just an hour drive from downtown Denver. This time of year, the drive alone is bursting with color thanks to the changing Aspens lining Rampant Range road, the main road leading to the trailhead. The 36o° degree view from the top of the lookout, in turn, floods you with views of colorful foliage. 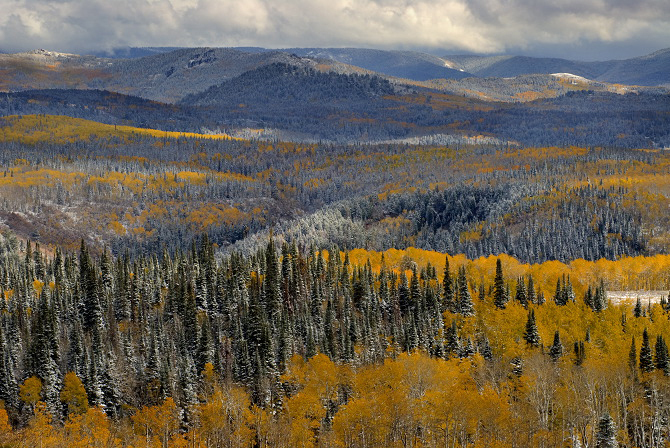 Your hike begins by passing through several large Aspen groves. The trail then takes you through Evergreen forest as you make your way along the Devils head trail to the base of of a massive granite outcrop. 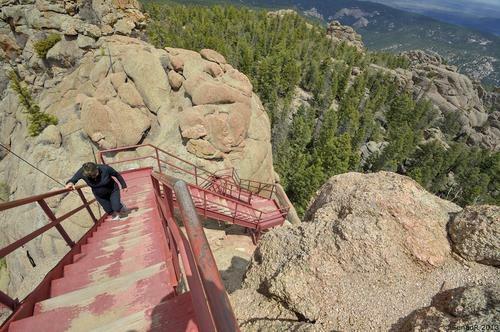 From there, you will be greeted with a flight of 143 steps built into the granite that lead you to the fire outlook. Total elevation at the lookout is 9,748 feet. Expect to be out of breath by the time you reach the top but I predict the view will be well worth the effort. Warnings: This is a popular hike! Go early to avoid the crowds. From Denver take Santa Fe (Hwy 85) south to Sedalia. Head west on Hwy 67 until you reach the Rampart Range Road. From there, drive south for about 7 miles and take the east turn to the Devil’s Head Trailhead. By mid to late October it may look like Glacier National Park has been abandoned by humans and left to the animals to scavenge as they prepare to buckle down for the long winter. But don’t let the empty campgrounds deter you! In fact, they should entice you! Fall is a wonderful time to visit the park. Granted, most of the guest services have closed for the season and there is always the looming threat of a snowstorm. But hiking trails are also not overrun with people and trees across the park are just begging for you to come admire their changing leaves. There are dozens of options for hikes in the park. For detailed information about all the ones that I know check out my Glacier National Park Hiking Guide. This time of year, one of my favorites is the Beaver Pond Loop, which starts near the Historic 1913 Ranger Station near St. Mary Campground. The hike is just over 3 miles, which means it is short enough that if you do get stuck in some nasty weather, you won’t have hours to hike to safety. It is also beautiful in the fall, as it passes through several aspen groves. Towards the end of the loop the trail will descend toward the shore of St. Mary Lake. I strongly encourage you to take the extra few minutes to hike to the shoreline, where you will be rewarded an impress view of the lake. Warnings: The pond from which the trail receives its name is an excellent moose habitat. It’s cool to spot one of these giants but don’t get too close! Getting There: Enter Glacier from the east side at St. Mary. Beaver Pond Loop is located at 1913 Ranger Station Parking Lot in the St. Mary area. The Little Horsetooth area is a lesser known part of Colorado’s treasured Rocky Mountain National Park. In the fall, however, this large valley is one of the best places in the park to take in the colors of the changing Aspens. The valley was formed by a 500-foot thick glacier that scoured out a distinct U-Shape that is now lined with Aspen Groves. The area is also dotted with small ponds known as sheep lakes that are a favorite among the area’s Elk population. One of the best hikes from this area is the Ypsilon Lake hike, which begins at the Lawn Lake Trailhead. After just over a mile of hiking you will reach the steep banks of the Roaring River, where you can witness the destruction caused in the massive 1982 Lawn Lake Flood, which was caused when a dam failed and spilled more than 300 million gallons of water down the Roaring River valley. From there you will passes along a mountain pond known as the Chipmunk Lake that provides a great view of Ypsilon Mountain. Eventually the trail will lead you to the Ypsilon Lake, which sits 8,540 feet at the base of the 13,514 foot Ypsilon Mountain. The lake is fed by a scenic nearby waterfall. The trail begins in the Horseshoe Park — which connects to the Little Horsetooth Area by trail. Drive 2.1 miles past the Fall River Entrance Station on Highway 34 and turn right onto Fall River Road. You will find the trailhead less than a mile from the junction on the north side of the road. Aspen trees encircle Maroon Lake — the starting point for one of a number of hikes in the Maroon Bells are of Aspen, Colorado. 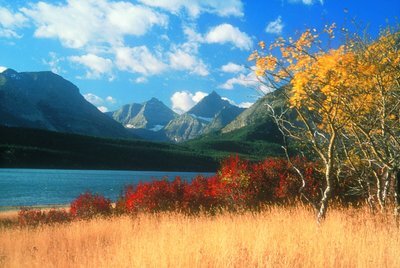 In the fall, this means the lake is surrounded by color that may momentarily steal your attention from the massive Maroon and North Maroon 14,000 foot peaks that tower in the distance. A popular backpacking trip from here is to hike the west maroon pass from Aspen to Crested Butte. However, winter comes early in the high Rocky Mountains, and the best time for overnight backpacking in this area is mid to late summer. In the fall, however, there are a number of shorter hikes that deliver breathtaking views without the distance. 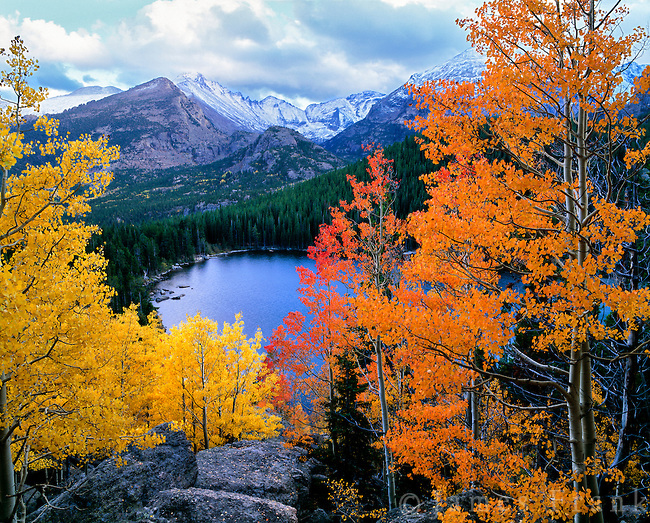 For the best view of the Aspens, try the short and sweet maroon lake scenic trail. The there-and-back trail takes you along the shore of the lake — where you get a panoramic view of the peaks —carries you over bridges and through forest as you make your way in and out of this Colorado wonderland. Expect that the short hike might take longer than usual. You will probably end up spending quite a bit of time staring at the Maroon Bell peaks through your camera lense. It is reported to be the most photographed sight in the entire state. The trail is located 10 miles from Aspen. Take Hwy 82 to the Maroon Creek Road exit. 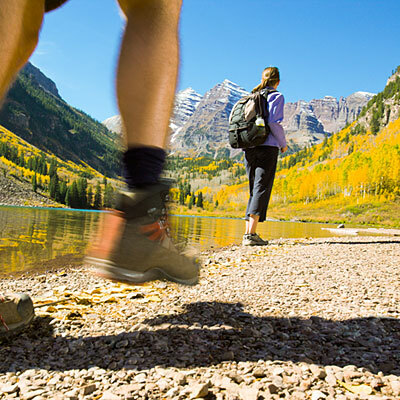 Follow the road to the Maroon Bells Welcome Station. Need help finding the right hiking boots? Check out our guides for the best men’s hiking boot and best women’s hiking boots.